When Lexus debuted the CT 200h at the 2010 Geneva Motor Show, it introduced the compact hybrid hatchback to the luxury automobile segment. The CT 200h has become one the brand’s best-selling hybrid model; since its launch in 2011, Lexus has sold about 300,000 CT 200h globally, including about 75,000 in Europe, one the largest markets for this model. With this latest update, Lexus looks to build on the model’s strengths and evolve upon the CT 200h’s well-earned reputation for efficiency and reliability, armed with a freshened exterior that embodies its exciting-to-drive nature — without compromising its user-friendliness and fuel economy. “The CT 200h has been refreshed and revitalized by enhancing its progressiveness. Its updated design is more emotional and sporty, making it the ideal premium hybrid compact for younger customers who enjoy spirited driving, but still care about the environment,” said Chika Kako, the Chief Engineer of the CT 200h. EXTERIOR DESIGN: A MORE DRAMATIC PRESENCE. The CT 200h now features a much more modern and aggressive front fascia, thanks to a new mesh pattern for the signature spindle grille that helps elevate the model’s sophistication. Also, the integrated bumper that ran across the grille just below the Lexus emblem is gone, as are the horizontal bars within the grille. The fog light bezels are now painted metallic grey and are surrounded by an outer frame with a triangular cross-section and sharp edges. The “arrowhead” DRLs (Daytime Running Lights) have been repositioned above the single-projector headlamps to create a sense of continuity with the side character lines of the car. Collectively, these new styling elements give the CT200h a more modern, athletic, and yet sophisticated appearance, helping this compact 5-door command a powerful presence when seen from the front. “We have pursued a new look by reversing the position of the LED headlight unit and DRL compared to the previous model. The result is a look that’s more aggressive than before. Moreover, the “L” motif of the DRL strengthens the Lexus signature,” said Tetsuo Miki, the Chief Designer of the CT 200h. At the rear of the car are new “L”-signature shaped taillights that give the CT 200h a sportier, wider appearance. New wider rear combination taillights have been changed to an all-LED configuration, with brightly illuminating LED turn signals at the bottom of the assembly, strengthening the “L”-signature look, as well as making the new CT more visible from behind. The upper and lower lines of the light-emitting section of the taillights thicken as they curve outwards, accentuating the width of the taillights and providing the rear end with a strong, stable presence. The back door garnish — enveloping the Lexus badge between the rear glass and the taillights — adds some athletic appeal to the vehicle’s already sporty rear-end. Also, the lower part of the rear bumper is now metallic silver and black, and reshaped to enhance the vehicle’s aggressive appearance, while the rear reflector bezels have been painted metallic grey to match the fog light surrounds up front. Spicing up the CT 200h’s profile are sportier wheels—from the base 15-in. pieces to the F SPORT’s 17-in. dark metallic alloys. Of note is the new ten-spoke 16-in. wheel that features a machined finish and dark metallic paint. One peek inside the cabin, and it is easy to see that the CT 200h offers among the finest interiors in its class, thanks to high-quality materials, rich surface textures and an attractive form-follows-function overall styling philosophy. 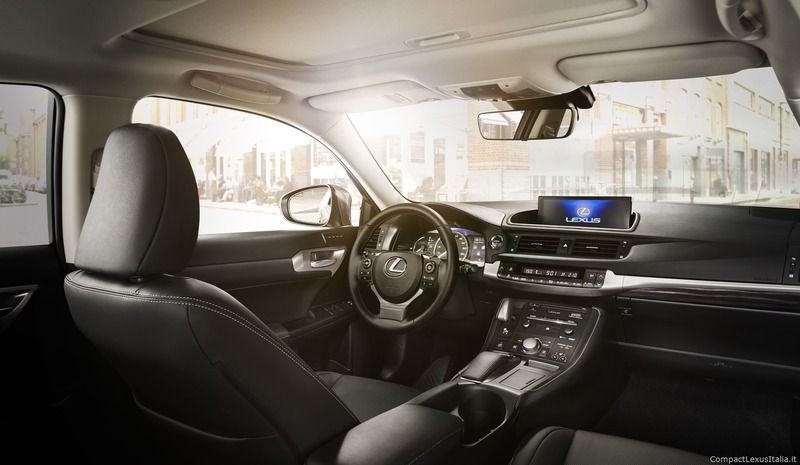 A Lexus Navigation System that features a larger 10.3-in. wide display screen (versus the previous-generation’s 7-in. monitor) is newly available. An expanded interior colour palette is available, featuring new combinations including striking two-tone smooth leather; a mix of fabric and long-wearing synthetic leather, and new all-fabric upholstery. A total of nine different ornamentation choices are available. The CT 200h F SPORT receives significant design changes for 2018 that include black metallic paint and an updated mesh pattern for the spindle grille exclusive to the F SPORT. The new mesh pattern has also been added as a backdrop for both the fog light inserts and surrounds to match. This model receives high-grade headlights that house a single projector high/low-beam headlamp. Also, exclusive to the F SPORT is jet black plating used on the upper and lower front grille moulding and a metallic black centre lower trim garnish at the rear of the vehicle. “The F SPORT attracts younger customers, so we’ve strengthened the vehicle’s exclusive black items to reinforce its sporty nature, namely the rear bezel and the rear lower garnish. The rear bezel has the same mesh design as the front grille, and the lower garnish is painted metallic black here while the normal grade color is silver,” the CT 200h Chief Designer Miki said. For 2018, the CT 200h will offer new two-tone exterior paint schemes and distinctive new colours for the F SPORT model: Lava Orange CS (Crystal Sunshine) and Heat Blue CL (Contrast Layering). Inside the cabin, the F SPORT boasts new exclusive interior combinations including two-tone leather, fabric an synthetic leather. An elegant Naguri ornamentation, which showcases high levels of Takumi craftsmanship, is exclusively available in the F SPORT. 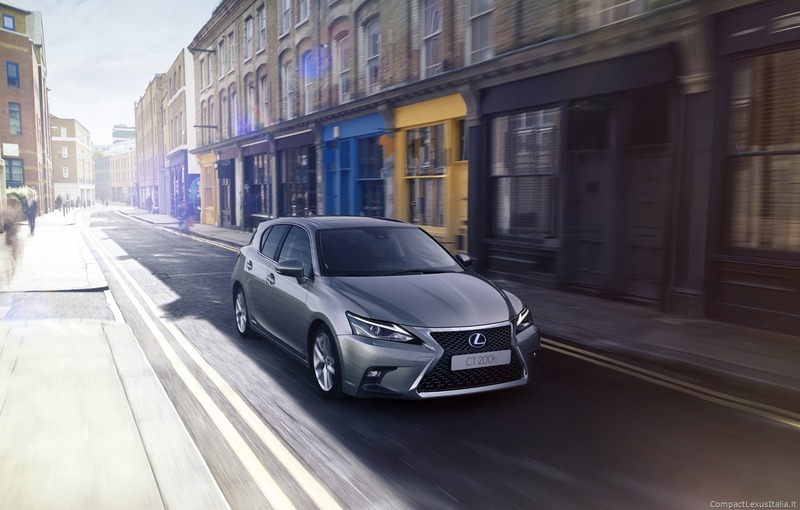 Another welcome addition to the updated Lexus CT 200h is the availability of the Lexus Safety System + that offers enhanced safety with advanced technologies such as Pre-Collision System (PCS), Dynamic Radar Cruise Control, Lane Departure Alert (LDA) with steering wheel control function, Automatic High Beam (AHB) headlights, and Road Sign Assist (RSA). Successivo Next post: La nuova crossover #Lexus #UX debutterà a fine 2018? 4 risposte a "Lexus CT 200h MY 2018"